Like all domestic goddesses born in the midst of the Green Revolution, my mom has a complex grocery shopping technique that has never been never adequately summed up by her explanation, “whatever looks best.” It incorporates all five senses (much to the embarrassment of my twelve-year-old self, when she routinely sniffed the stem-ends of a dozen Costco cantaloupes), and is even synced with the artificial thundershowers in the vegetable section. Dewy, jewel-toned and blemishless, her picture-perfect produce always seemed to have just arrived from some seasonless supermarket Eden. Which wasn’t far off, if you figure Eden was probably someplace in Mespotamia. But some ancestral agrarian wisdom – residue of her Tennessee farmgirl past – also nudged her to adhere to the occasional seasonal law: asparagus in spring, summer strawberries, Christmas clementines. These items were dinner table treasures, redolent with rarity…if not always with flavor. Because it turns out that, according to the new online shopping tool Global Grocer, there’s still a 75% chance that supermarket asparagus was imported from Peru or Mexico, even in springtime. In our supersaturated, season-free food culture, US food imports are rising at dramatic rates (importation of agricultural products has increased 50% since 2004 alone) and decimating domestic family farmers, local economies, the environment, and sometimes our health. Developed by Food & Water Watch, Global Grocer is an interactive guide to your food and where it might be coming from. 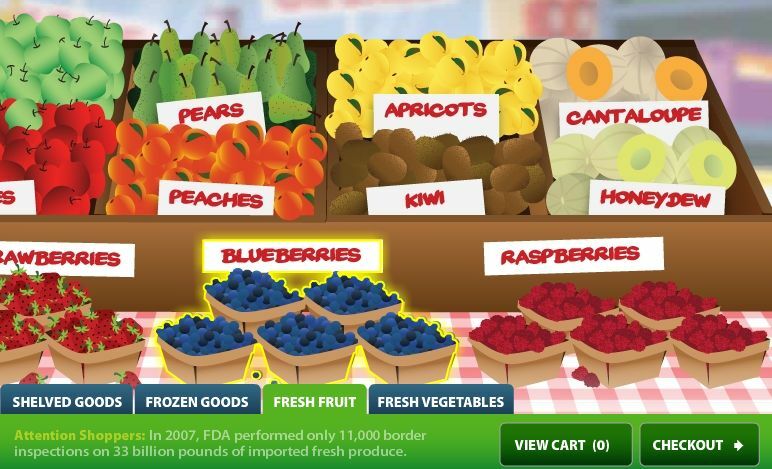 Browse the noisy animated aisles, pick your produce item (fresh, frozen or processed), and read the rundown on its origins, including top exporters and the probability that it was imported. Fill up your virtual cart, proceed to checkout, and find out how likely it is that you’ve selected imported fruits and veggies; the array of countries they came from; and how many pounds of jet-setting produce you probably purchase per year. If these numbers alarm you – and they should – Global Grocer has some advice: shop at outlets that sell local food, and tell your supermarket that you demand country-of-origin labeling. Though seemingly vestigial in the contemporary supermarket, seasonal impulses like my mom’s could help save small farms and the planet – but only if they’re supported by adequate origin labeling, so shoppers can distinguish between good, local, seasonal food and over-traveled, chemically ripened, unseasonable food. Any locavore will tell you that embracing rarity, far from being an altruistic sacrifice, is actually a deliciously hedonistic adventure; my mother and I discovered that together – in the garden we learned to grow. But Americans can’t reclaim rarity as a cultural value until we are able make educated decisions about not just what to buy, but where to buy it from – and consequently, when. Click here to embed the Global Grocer widget on your website. Not sure what’s in season? Consult Eat Well’s Seasonal Food Map. Eat Well is lucky to have you! I love how you haven't missed much in your life experiences. You seem to have taken it all in and use it again, sooner or later. I also like the Seasonal Food Map! Your job sounds amazing by the way, I am a little jealous! I like your blog a lot and do miss that you don't add to it. You have a lovely writing style and the information is just what I enjoy most.